(Revised 7-1-2007) Eutrophication—the process whereby nutrients (primarily phosphorus) in water cause excessive and unhealthy aquatic plant growth, particularly of algae—has recently received a great deal of attention by the media nationwide. Many city governments across the country have responded by banning lawn fertilizers containing phosphorus. Lawn fertilizers aren’t the prime culprit. Scenes like this are. It has been known for some time that phosphorus build-up in lakes, rivers and ponds leads to abnormally high levels of algae, which depletes oxygen in the water, chokes out other plant life, kills fish, and renders the water unsuitable for swimming and other forms of recreation. But remember, some level of phosphorus in water is essential—remove it completely, and all plant life and fish will die. One of the wonders of nature is that most of the time, phosphorus levels in water exist within a healthy balance. So where does the excess phosphorus come from? Everyone in authority is pointing a finger at lawn fertilizers, but the fact is, lawn fertilizers are only a piece of the puzzle. Excessive phosphorus in water can come from nature itself. There are remote lakes and streams on the planet untouched by man and literally a thousand miles from the nearest garden or farm that suffer from excessive phosphorus content. Phosphorus deposits in the ground enter these waters as soil erodes; organic matter (in which phosphorus is always present) enters as leaves drop from shoreline trees and shrubs, two important causes of eutrophication I’ll relate back to in a minute. It’s important to note that phosphorus is an immobile soil nutrient. Inorganic phosphorus (such as phosphate, the form found in fertilizers) moves very little in soil. Instead, it bonds readily to soil particles and has a very difficult time leaching through the soil into lakes and ground waters. Fertilize a sprawling, two-acre lawn on the shores of a suburban lake three or four times a year and after a decade, a soil test will show such a high phosphorus level that a phosphate-free fertilizer could be used for the next decade. Yet, during a heavy rain, as rainwater washes off that lawn into the lake, the amount of phosphorus in the runoff is negligible. In fact, a healthy, lush green lawn combats eutrophication in two ways: it absorbs water like a sponge and inhibits soil erosion, and does both much better than areas of wooded, undeveloped shoreline. You can tell this is a complicated topic when the Renegade Gardener actually defends grass lawns. Ah, but what if lawn fertilizer had just been applied? Now, in extreme cases of torrential rain, you’ve got problems. Fertilizer containing phosphate floating up across the lawn and into the lake (or off lawns, into the street, and down storm sewers) most definitely contributes to algae growth in our area lakes. But we haven’t met the biggest culprit yet. Avoid blowing leaves or grass clippings into the street or driveway. Cut grass where it borders the street or any paved surface so the clippings are blown back into the yard, or bagged for compost. Sweep or rake up organic materials found in the street. Limit the amount of paved areas on your property. Don’t apply fertilizer to lawns just before heavy storms are predicted. Application prior to normal rain is OK.
Never fill your fertilizer spreader on a paved surface, and never cross a driveway with the hopper open. Close the hopper when approaching the road bordering your lawn. Plant to prevent soil erosion. 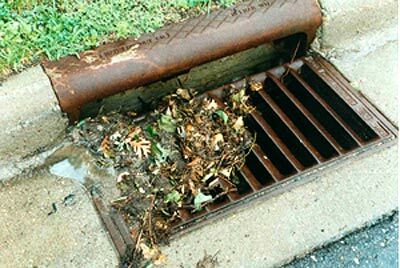 Eroding soil can be miles from a lake but will contribute phosphorus via runoff in storm sewers. Are city bans on phosphorus fertilizers necessary? Yes. Every bit helps. Citizens should pressure city councils to ban the use of lawn fertilizers containing phosphates, with the stipulation that they may be applied only if a proper laboratory soil test proves need. But more important, self-impose a ban on grass clippings and other forms of lawn waste moving from your property into the street. The facts are now clear: Every curb is a shoreline.